Blend of real cheeses makes a perfect start! Mild, creamy queso dip made of a blend of white cheeses and hatch green chiles. Seasoned ground beef topped w/ cheese, lettuce, tomatoes & guacamole. 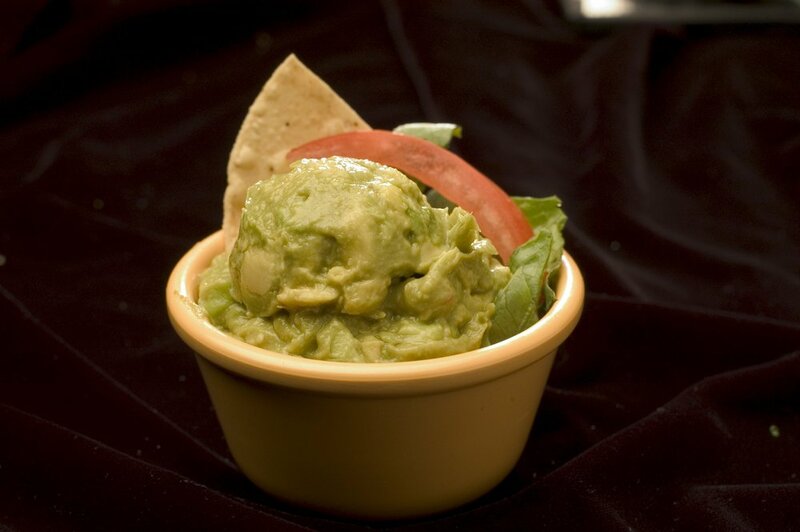 We are renowned for having the freshest avocado dip. A rich chicken broth soup served w/ avocado, mesquite-grilled chicken & tortilla strips. Served w/ cheese & sour cream on the side. Served on a bed of lettuce topped w/ brisket & a side of Hatch green chile queso; garnished w/ a tropical fruit pico. A crisp flour tortilla bowl filled w/ spicy beef, beans, shredded lettuce, tomatoes, guacamole & cheese. Tender mesquite grilled beef or chicken fajita meat, mixed greens, tomatoes & cheese. Served w/ your choice of dressings. A perfectly seasoned salmon fillet served on a bed of mixed greens & topped w/ tomatoes. Your choice of salad dressings. ALL FAJITAS are served w/ refried beans, papas, rice, cheese, sour cream, pico de gallo, guacamole & fresh hot corn or flour tortillas. Specially grilled steak, chicken or shrimp grilled over a mesquite fire & topped w/ caramelized onions & bell peppers. 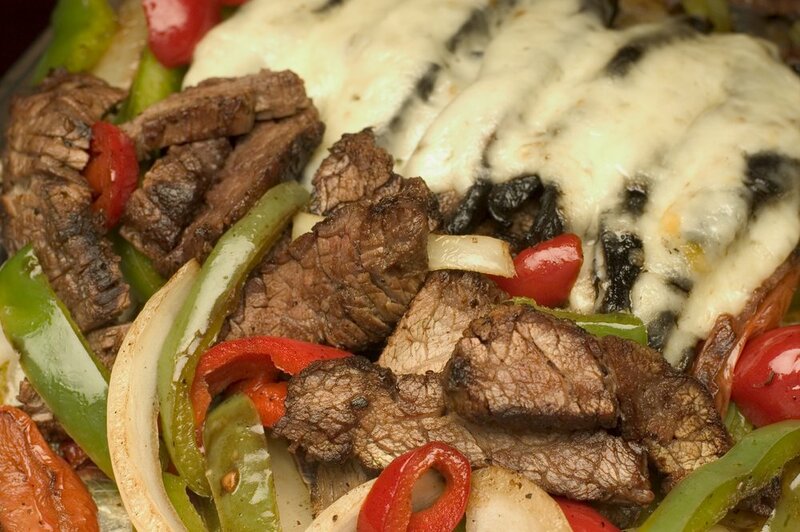 Tender mesquite grilled beef or chicken fajita meat topped w/ grilled portobello mushroom & melted Monterey Jack cheese. A mix of fresh veggies - squash, onions, bell peppers, & portobello mushrooms grilled until tender. Two flour tortillas filled w/ beef or chicken fajita meat, melted cheese, caramelized onions & bell peppers grilled to perfection. Served w/ guacamole, pico de gallo & sour cream. Two flour tortillas filled w/ aged cheddar & Monterey Jack cheese & mouth-watering grilled portobello mushrooms. Served w/ pico de gallo, sour cream & guacamole. Two flour tortillas filled w/ juicy shrimp, caramelized onions, bell peppers & melted cheddar and Jack cheeses. Served w/ guacamole, pico de gallo & sour cream. An all-time favorite! A taco, enchilada & tamale. Served w/ rice & beans. Three enchiladas served w/ rice & beans. Enchilada choices: taco beef, shredded chicken or cheese topped w/ red, green or sour cream sauce; upcharge for substitutions. A stew meat & bean burrito covered w/ chili con carne & cheese. An Anaheim pepper filled w/ cheddar cheese & lightly battered; topped w/ Espanola sauce & cheese. Served w/ rice & beans. Named after our boot trading Compadre! Stew meat & bean burrito covered w/ cheese. Served w/ an extra helping of stew meat on the side & fresh hot flour tortillas. A choice of brisket, beef or chicken fajita meat rolled in a flour tortilla w/ grilled onions & peppers; topped with queso & sour cream sauce. Served w/ rice & beans. Named after the lady who started it all! A chile relleno, enchilada & taco. Served w/ rice & beans. Choose from fajita beef, fajita chicken or brisket rolled in a flour tortilla w/ cheese; then fried to a crisp; topped w/ queso. Served w/ rice & beans. Three corn tortillas filled w/ shredded chicken or beef then deep fried until crisp. Served w/ beans, rice & a side of queso. Tender stew meat seasoned Mexican style. Served w/ beans, rice & corn or flour tortillas. Two soft corn tortillas filled w/ mesquite grilled beef or chicken fajita meat. Served w/ lettuce, tomatoes, cheese, guacamole, pico de gallo, beans & rice. Three crispy corn tacos filled w/ your choice of taco beef or shredded chicken, lettuce, tomatoes & cheese. Served w/ beans & rice. Two flour tacos filled w/ your choice of taco beef or shredded chicken, lettuce, tomatoes & cheese. Served w/ rice & beans. A generous portion of mesquite grilled beef or chicken fajita meat, grilled onions & bell peppers, wrapped in a soft flour tortilla. Served w/ pico de gallo, guacamole, rice & beans. ALL COMBINATIONS SERVED W/ RICE & BEANS. Enchilada choices are: taco beef, shredded chicken, or cheese topped w/ red, green or enchilada sauce; upcharge for substitutions. One enchilada and a taco. Two enchiladas and a taco. Three enchiladas and two tacos. Chile relleno and a chalupa. One enchilada, a taco and a chalupa. Two enchiladas and a chile relleno. Two enchiladas and a chalupa. Mesquite grilled chicken breast covered w/ a spicy chipotle-honey glaze. Served w/ rice, charro beans & fresh avocado slices. Grilled chicken breast topped w/ sautéed onions, tomatoes & fresh cilantro. Served w/ guacamole, pico de gallo & rice. Two enchiladas filled w/ fresh guacamole & covered w/ our Hatch green chile queso. Served w/ rice & beans. An Anaheim pepper filled w/ cheddar cheese and crispy texture. topped w/ our Hatch green chile queso. Served w/ rice & beans. Add taco beef, shredded chicken or brisket at n/c. Our brisket is slow cooked for twelve hours with a blend of spices and onions. Three enchiladas filled w/ shredded chicken; topped w/ a zesty roasted tomatillo sauce. Served w/ rice & beans. Brisket rubbed w/ chipotle & a variety of spices, slow cooked until falling apart tender. Served in two flour tacos & topped w/ Monterey Jack cheese w/ Charro beans, guacamole & pico de gallo on the side. Two enchiladas filled w/ a chipotle sauce mixed w/ ground beef; topped w/ green chile sauce & chile con carne sauce & cheese. Served w/ jalapeños, onions, rice & beans on the side. Our slow cooked brisket rolled in a flour tortilla & covered w/ an incredible tasting green chile & corn stew; topped w/ jack cheese. Served w/ lettuce & tomatoes. $1.00 per order will be donated to the MTK Foundation. Lightly seasoned salmon filet perfectly grilled; Served w/ guacamole, Charro beans, rice & pico de gallo; garnished w/ lemon & lime. Comfort food at its best! Ground beef & potato soup, topped w/ freshly sliced avocados. Served w/ pico de gallo, cheese & corn or flour tortillas. Mesquite grilled chicken or beef fajita meat on a bed of mixed greens; topped w/ tomatoes & cheese. Your choice of dressing. Aged beef or chicken fajita meat grilled over a mesquite fire w/ caramelized onions & bell peppers. Served w/ guacamole, pico de gallo, cheese, sour cream, beans & rice w/ corn or flour tortillas. Two enchiladas filled with shredded chicken; topped w/ a zesty roasted tomatillo sauce. Served w/ rice & beans.